George Downing "1999 Surf Pioneer"
After being taken under the wing of legendary hot curl rider Wally Froiseth during WWII, he became a true student of the sport. A tall and slender Hawaiian, George Downing was one of the early big wave pioneers in Hawaii during the 1940's and 1950's. He shared his skills and the knowledge of his ancestors with everyone he met. George is credited with being the first surfer to develop a subtle quiver and the first changeable fin system. He also created the first real big wave gun in 1951. His sessions at Makaha, sent around the world via the Associated Press Newswire, inspired many of the first wave of California to make their annual winter pilgrimage to the North Shore. 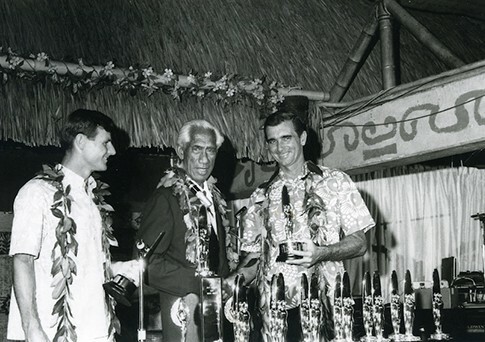 He later used his skills and leadership as the executive director of the Quiksilver Eddie Aikau Memorial event held in large surf at Waimea Bay.